Installed over the existing floor and only 18mm in depth, Overlay allows floor heating to be installed where traditional under floor systems would either require expensive excavation or would require the floor to be raised to an unacceptable level. Overlay panel is a fibrous panel used for heavyweight floor coverings such as ceramics, or where the floor covering needs to be secured directly to the panel, e.g. solid wood. Overlay systems use a 12mm pipe at 150mm pipe centres and provide excellent response times and heat output compared with traditional built in under floor heating solutions and are therefore ideal for both traditional heating systems and low temperature renewable systems. * Cover board thickness indicated are minimum. 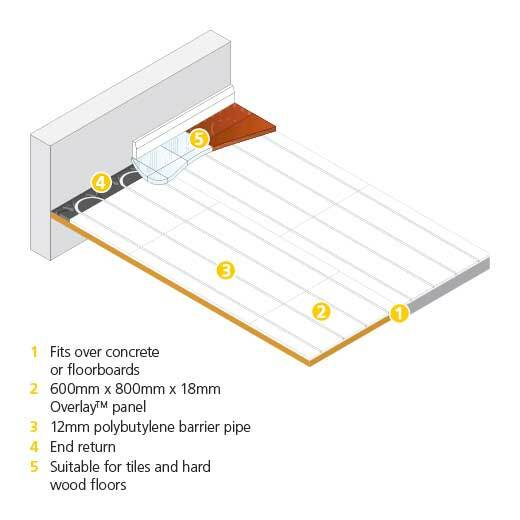 The maximum thickness of any cover board is 18mm. Sheet products other than those shown may also be suitable. ** If using Karndean or Amtico type flooring, refer to manufacturers for suitable floor finish.